Today I participated in an Amish Fundraiser. The Amish community is famous for working together to raise a new barn, when one of their members or neighbor’s barn burns down. 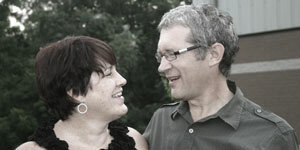 They are also quite adept at raising funds for various needs and causes in the community. A number of years ago I helped out with a pizza fundraiser, so I said yes when Mr. Hostetler asked me to be one of the van drivers. I got up at 5:30 this morning, before first light, and headed over to Walnut Creek to pick up “my people”. Last time I went, I drove a couple of Amish men around to sell and deliver pizzas. This time Emilene Hostetler and Melissa Miller got the honors to distribute the goods. This was the first go around for the young ladies, I think they were a bit nervous as to how this was going to go down. We headed up through Mt. Hope, Ohio on SR 241 and north toward Kidron. As expected, when we arrived at the pizza pick up point, there were plenty of other vans getting loaded up. It was a well organized operation with tables set up along the driveway, all loaded and ready to go for each van driver. In addition to the pizzas and candy, we also got our “route map” which marked the roads we would cover. The girls said there were about 3,000 pizzas made for this fundraiser. The ingredients for the pizza come from Walnut Creek Foods and are “assembled” by a crew of Amish people on Friday night/Saturday morning. The last time I went, the funds raised were used to pay off somebody’s hospital bill. This time the funds will go to Woodside Rest, a transitional residential facility designed to meet the needs of members of the Amish and Old Order Mennonite churches who are recovering from a mental/emotional, and/or an addictions illness. While at the home, residents attend counseling with professional therapists who work at SpringHaven. 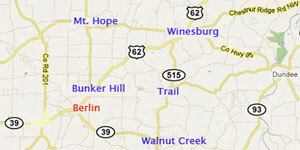 The home is located near Dundee, Ohio. About 7am we got to our first route destination and the girls did an awesome job selling the pizzas. Pretty much everyone bought at least one pizza. Twice, the girls sold 7 pizzas to one family. They were pretty happy about that. They also sold some delicious caramel chocolates with sea salt made by Gorant Chocolates. I know, I bought a box. It was a cold beautiful morning and we traversed some township roads I’d never been on before. About 45 houses and 6 hours later, our share of the pizzas were all sold and I delivered the girls back to Emilene’s home in Walnut Creek. 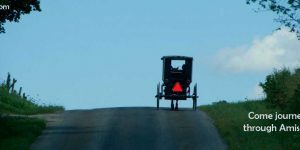 I had a thoroughly great time driving the girls around and taking in the beautiful Ohio Amish countryside. It was an enjoyable and highly successful endeavor. The Amish have this fundraiser down to a science.